This year’s Thanksgiving feast will be a small affair. Me and the kid (hubby is working his usual retail hours) will chow down on Cracker Barrel take-out at my parent’s condo. I’m in charge of wine and pumpkin pie (my favorite courses). 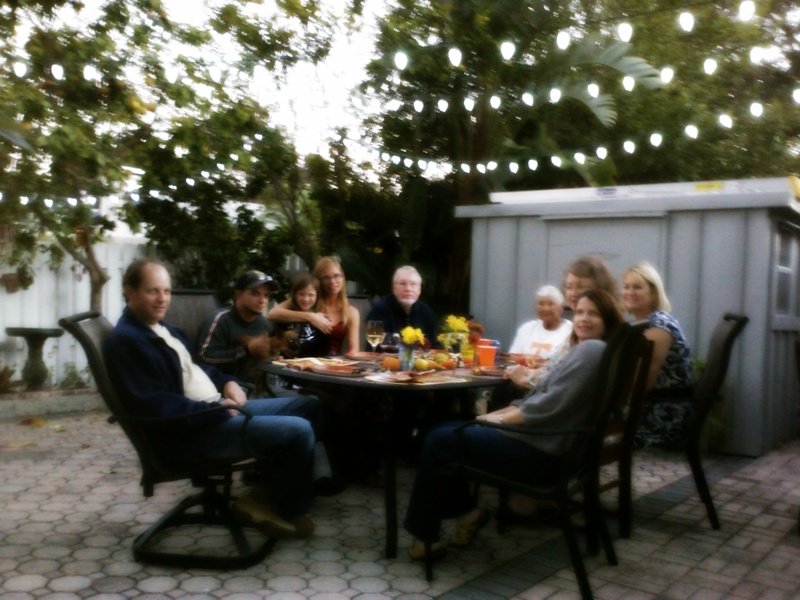 Last year’s feast was at my place out on the patio. Tall shot glasses and coffee can vases held brown and yellow daisies I asked the kids to arrange for centerpieces. If you took a still photograph of the table and those that surrounded it you might think it to resemble a modern-day picture of Leonardo da Vinci’s The Last Supper. But not because there was a man dressed as Jesus, flanked on either side by disciples, and not because there was news of change and fate (although my mother-in-law is real good at bringing everyone down with her latest guess-who-died tale). It might conjure like-imagery because of the man who created the painting, and that in that painting the guests surrounding the host came from different backgrounds and different eras. Leonardo da Vinci was not only a painter, but an inventor, observer, and experimenter. He was a renaissance man. I have often described myself as Jane-of-all-trades, master of nothing. In my lifetime I have painted, sculpted, observed, experimented, and even invented (those inventions being stories crafted in my brain and poured onto notebook or computer screen). So in that way Leo and I have a bit in common. At our Thanksgiving supper I sat in the middle of the table. That way, I can be a part of the various conversations around me and become included, if I so choose, into any one of them (although at one point I found it necessary to quickly become excluded from an uncomfortable mom-in-law dialogue I’ve heard at least fifty times). I loved being flanked by my friends and family. I wouldn’t call them my apostles, even though they are my supporters, my advocates, my champions. I would call them my “strays”. 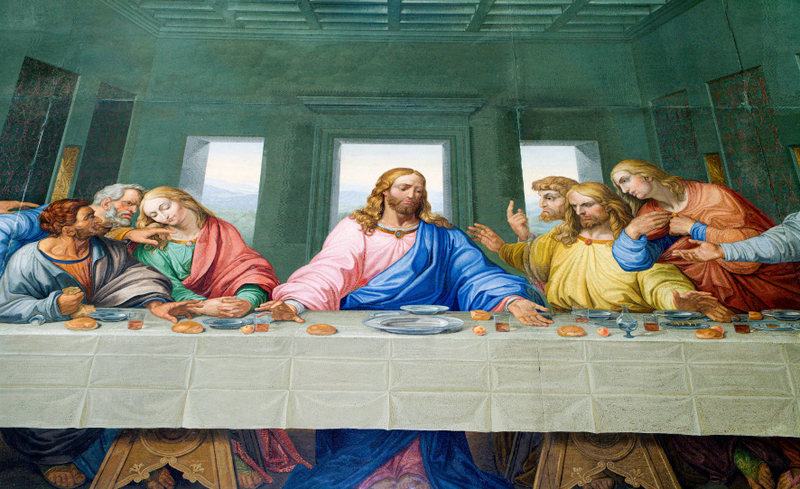 In The Last Supper Jesus is flanked by twelve apostles, one of which was Philip. At my table there was Phyllis, who used to be Phillip. After the transition she was ostracized by most of her family, except her son Dustin, who was also at our table. A slight, ex-death metal singer with a great smile and a knack for art, he entertained the kids with his shark drawing and stories of playing music. My parents were also there. They never warmed to any of my stray friends growing up, but in this moment they broke bread with my new ones, with whom they’d become acquainted and fond of over the years. On the opposite side of them were my friends Bryan and Madeleine, who had no family within at least 400 miles, but who had become more like family to me than many of my blood relatives. Then there was Debbie, my single, lesbian neighbor, who always brings cheap beer for herself and ice-cream for the kids at any party in the neighborhood. She is much like a child herself, requiring patience from those around her, but also bringing forth innocence and unabandoned laughter. When the last of the chicken (come on, it’s tastier than turkey), dressing, green-bean casserole, cranberry sauce (shaped like a can), sweet potatoes, salad, and yeast rolls were scraped and gobbled from our plates, we posed for a group photo before dessert. And not unlike Da Vinci’s infamous would-be fresco, there were those that came from near, far, and of different ideas and tastes. But all there to feast together, to tell stories, to listen, to laugh, gasp, question, and remember. Happy turkey day to you, too! Thank you so much for the comments. This year was the first Thanksgiving in a decade that I didn’t have to endure mother-in-law drama. I feel so at peace! Sometimes (heck, most times) good company overrides subpar food, right? You might want to write a post about this. I’m sure many people could relate. My mom reminded me some of the crap my mom-in-law said over the years at Thanksgivings past. I had eradicated them from my memory. Was so glad I didn’t have to endure it this year. I love this story. i think we can all see ourselves and our “families” in this description. Thanksgiving is about giving thanks for all the blessing in our lives, good and bad. We all have our “misfits” because that is what family is all about. I hope you have a wonderful “chicken” day with all of your friends and family. Thank you so much. I hope you had a wonderful Thanksgiving as well! “master of none” – no, you are a masterful writer. Own this, please. Also, I have the sense that you are a masterful Mom. Just a feeling I get, and my feelings in this arena are powerful. I loved your description of last year’s Thanksgiving. Hosting what I call “an orphan’s Thanksgiving” is the best – all the stray friends and neighbors from near and far, who come together at your table – yet another thing you have mastered. Hospitality, compassion, and getting all the food to the table at the same time. Thank you so much. Yes, I will own this. And that I am a master dishwasher-loader. I really enjoy your posts, Jenifer. I hope you have a lovely Thanksgiving. Thank you so much! I hope you had a lovely Thanksgiving, too. I gave Cherry some crust from my pumpkin pie. : ) Did Sophie get a special treat?